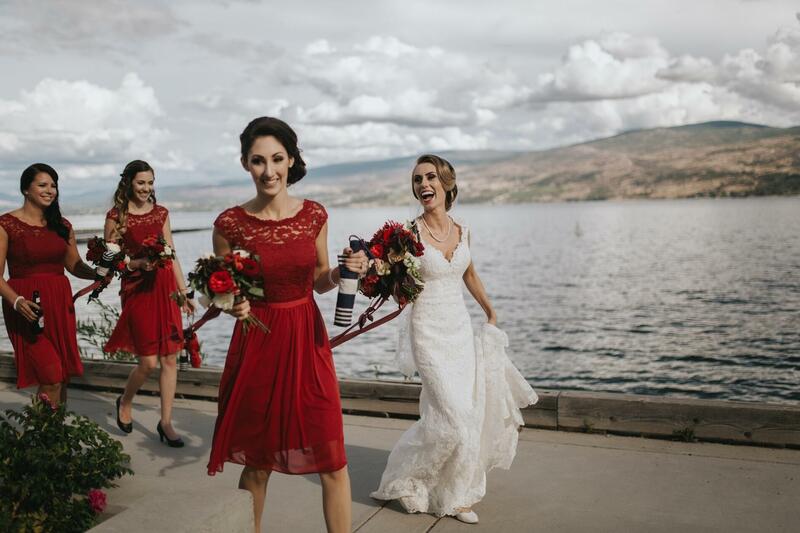 The four-season beauty and tranquility of Kelowna provide an unforgettable backdrop any time of year for your wedding at The Cove Lakeside Resort. Overlooking Okanagan Lake, framed by landscaped gardens and mountain views, we provide an Okanagan Valley wedding venue unlike any other in British Columbia. During the spring and summer, views of the sparkling lake at sunset inspire gatherings large and small. Fall brings an orchestra of color to the trees surrounding the resort. When the temperature drops, the snow-draped landscape creates a cozy winter wonderland for your gathering of family and friends. Allow us to enhance your vision of your special day with a ceremony on our Beach along the shores of Lake Okanagan or within our hand crafted Garden, cocktails on the Garden Terrace, followed by a reception the Grand Ballroom or within our signature Garden Marquee and retire to your complimentary honeymoon suite. 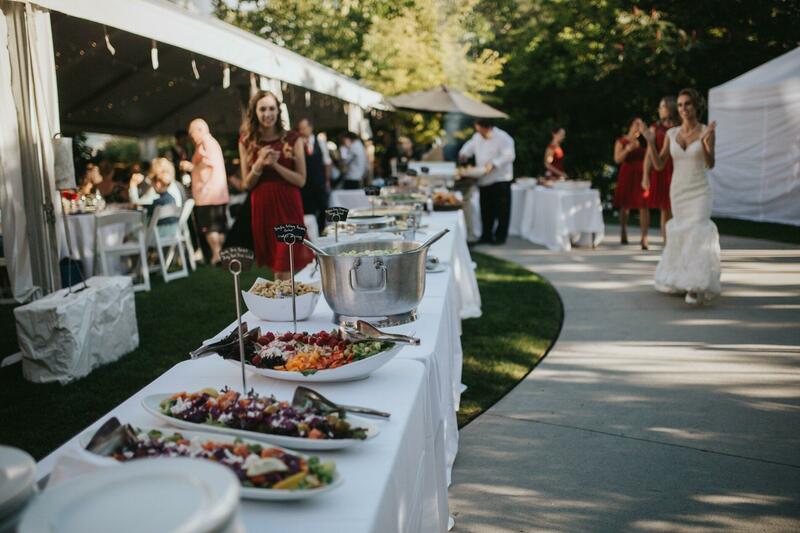 We are happy to arrange special rates on accommodations for your guests and planning assistance for wedding party outings, rehearsal dinner, brunch, group outings and activities, and local tours throughout the Kelowna area. 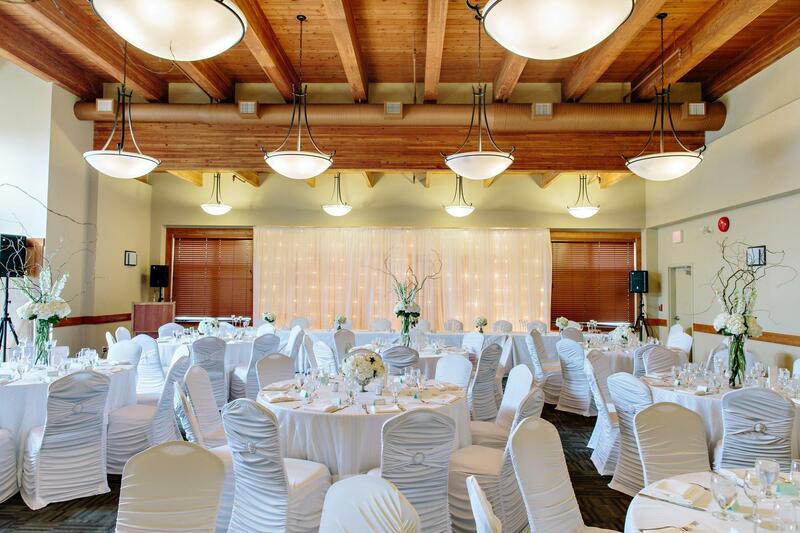 The Cove offers a variety of unique outdoor and indoor venues for your wedding ceremony and celebration in West Kelowna. Explore our venues below and start planning! A handcrafted garden oasis of winding walkways and flowering shrubs leads you to the wedding arbour and ceremony venue for up to 150 seated guests. 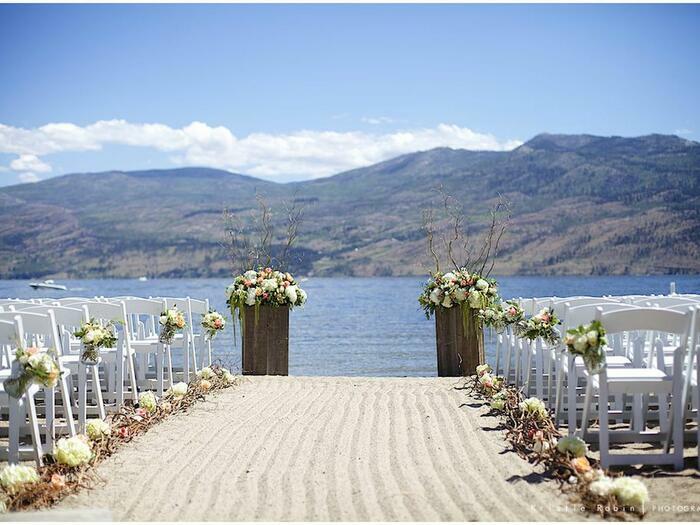 A picturesque sandy beach on the shores of Lake Okanagan make this The Cove’s Signature Ceremony venue for up to 150 seated guests. Experience our newest ceremony venue! Open skies, hillside vistas, pasturing thoroughbreds and towering sunflowers encapsulate our edible garden and ceremonial meadow for up to 150 seated guests. 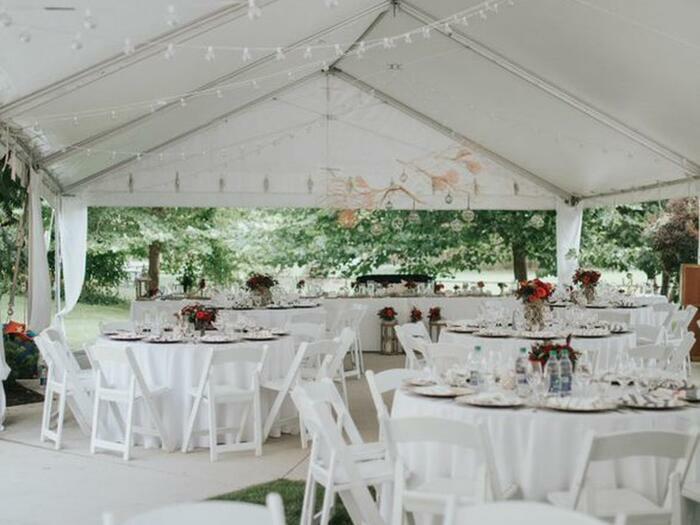 Delight in an alfresco dinner under the big tent for a true garden dinner experience. It is dinner party perfection for up to 150 seated guests. Dazzle your guests in this warm earth-toned room featuring natural lighting, vast 20-foot vaulted ceiling and a private terrace. Dining for up to 100 seated guests or a cocktail dance party for up to 150 guests. Outdoor cocktail parties for up to 100 guests, with scenic views of our garden oasis, the historic Gellatly Nut Farm and Okanagan Lake. 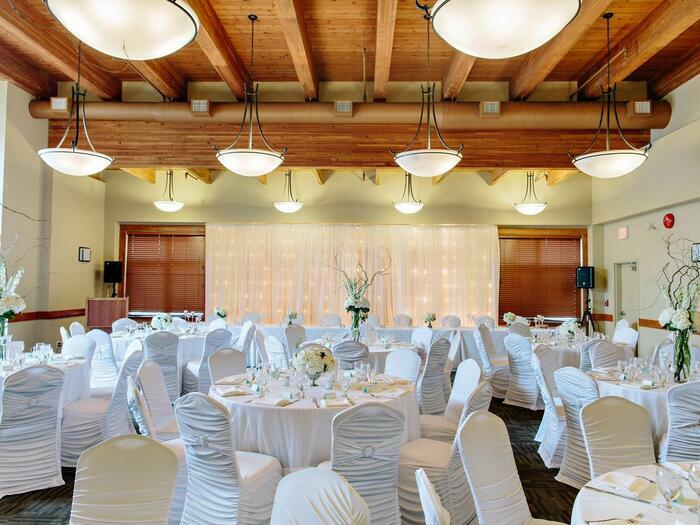 Natural lighting highlights this venue with large picture windows overlooking our Gellatly Garden and mountains beyond. Ceremonies and cocktail parties up to 100 guests. Great place, great service, great everything! My husband and I got married at The Cove in 2014 and we go back every year for our wedding anniversary. I couldn't say a bad word about it if I tried. It poured rain the day we got married making the beach a wet mess and I didn't have a back up plan. The Cove worked with a local events company to get a tent put up and other accommodations made ASAP day of. For our wedding anniversary each year they always congratulate us and have at least a card in our room. Whenever we have friends getting married or know people travelling to the Kelowna area we always recommend The Cove. I would give The Cove 10 stars if I could! Set up of the above items is included. Guests never have to worry about being late for your big day when they stay here at the resort. The Cove provides luxurious, spacious 1, 2 and 3 bedroom suites offering an array of scenic views, perfect to accommodate larger families and weddings. Without ever leaving the resort, guests can enjoy indulgent massages and body treatments at the Spa at The Cove, swimming in our two outdoor lakefront pools and hot tubs, fresh cuisine at Bonfire Restaurant, exhilarating watersports at Lakesurf Okanagan, outdoor fire pits and BBQ’s and more. Spacious, condo-style suites, a fully equipped fitness center, pet friendly rooms, tennis courts and a putting green complete The Cove experience. Located near a variety of golf courses, wineries, outdoor recreational activities and more, there's never a dull moment during your stay and plenty of perfect spots for a bachelor or bachelorette party. Come discover a truly unforgettable destination among Kelowna waterfront hotels and experience all the Okanagan has to offer. As a special gift from us, a one bedroom suite is offered complimentary for your wedding night with all wedding bundles and reception packages. Special wedding accommodation rates are offered to your guests. We strive to ensure that your wedding is the most perfect day imaginable so that you and your guests will continue returning again and again for anniversaries and other trips, to explore everything our great resort and surrounding area has to offer. Our team at The Cove Lakeside Resort is passionate about producing extraordinary and memorable wedding experiences. 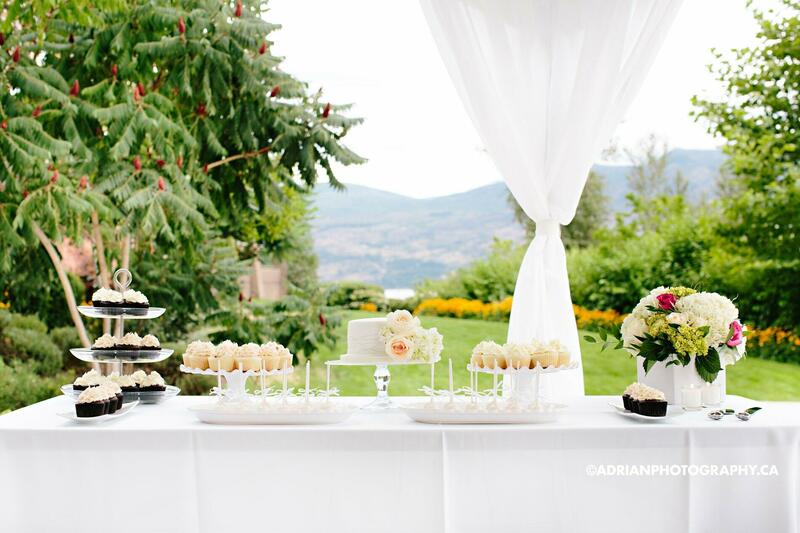 We look forward to providing you with a picture perfect Okanagan wedding experience here at The Cove Lakeside Resort.